When I switched from LastPass to 1Password from Agilebits a few years ago, the only thing I missed was the method LastPass used to allow password sharing. Steve and I share a lot of passwords so this was super important to us. In LastPass you could simply select a login and share it to someone either as read only or with privileges to change the password. It wasn’t perfect but it worked for us. In 1Password it’s done differently and I didn’t like it nearly as much. You create multiple vaults. Steve has his own primary vault, I have my own primary vault, and we both have write privileges to a third shared vault. Setting it up wasn’t too hard: one person creates it, puts it in Dropbox and then shares it. The good news was that we didn’t have to have a third password to open it, we both access it with our own 1Password password. The bad news is that when you’re searching for a password, you have to remember in which vault you saved that particular login. Early on, I was constantly trying to get into my bank account and not being able to find it (panicking that I’d somehow deleted the entry in 1Password) but the problem would be that it was in the shared vault, not my primary vault. Having to remember in which vault you stored a login was a real pain. Over time I didn’t panic but I was still constantly frustrated when I had to switch vaults. In the plugin for browsers, I got into the habit of searching and then using command-1 and command-2 to toggle between the vaults to figure out where my logins were. It worked, but I was cranky at all times. It was even worse in iOS because you had to go through several screen taps to switch vaults. I love the folks at AgileBits but I was never happy when I had to do this. There was a huge improvement to the iOS app a few revs back. They added the All Vaults option, allowing the user to search across, well, all vaults. 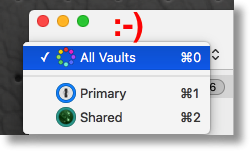 Unfortunately there were (and I think still are) a couple of bugs with it, the most significant of which is that being in All Vaults can stop 1Password from syncing with Dropbox. I was caught on iOS several times without my latest passwords because of this bug. I’m sure they’ll get it sorted, but I sure hope it’s soon. I always forget that I only have to switch to a specific vault and back to kick Dropbox in the pants to let me have my passwords. But this isn’t a complaint post, this is a celebration of a glorious upgrade in the Mac version of 1Password. They just released version 6 and it has a wonderful new feature. If you have the non-Mac App Store version of 1Password you’ll get a notification of an upgrade available. For me that took me from version 5.4.2 to 5.4.3. That version enables the automatic updater from within 1Password, so as soon as I relaunched 1Password I was offered version 6. Nice that they’ve added the updater inside the app, but that’s not the best part. Here’s the glorious news – now you can keep your Vault set to All Vaults in the native app and in the plugin. You can still use command-1 and 2 to switch between vaults but now command-0 lets you switch to All Vaults. This makes me so happy I could cry. As long as it still lets Dropbox sync to work that is. Thank you, once again, for such a great blogpost. As someone with multiple vaults myself, I agree, the new All Vaults feature is pretty damn awesome! I’m so glad to hear that it is making your life easier. I know it has mine. 1Password remembers all your passwords for you. safe behind the one password that only you know.